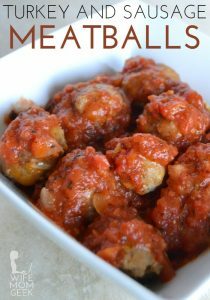 These low carb turkey and sausage meatballs are a tasty appetizer whether you're on a low carb diet or not. They're savory, juicy and cheesy. What more could you want? Roll meat mixture into 1 1/2-inch balls and place on baking sheets lined with foil. Bake in oven for 18-20 minutes, or until juices run clear.